Japan Airlines has finally unveiled the latest long-haul 767-300ER cabins dubbed SKY SUITE 767 (SS6). JAL will be installing a brand new business class seats - SKY SUITE II and the well received JAL SKY WIDER seats on the SS6. JAL plans to launch thison the Tokyo Narita - Vancouver route in December 2013. AIR YOSHINOYA is back for a limited time! Japan Airlines has once again collaborated with popular gyūdon (beef bowl) restaurant chain Yoshinoya to serve AIR YOSHINOYA as the 10th installment of the popular AIR SERIES, an inflight meal served in Premium Economy and Economy Class. This will be served on select long-haul flights between September 1 and November 2013. Trip reports on American Airlines, Cathay Pacific Airways, and Japan Airlines premium cabins. Latest entries on JAL First Class Japanese menu of the first meal service. Japan Airlines has rolled out a brand new inflight service called JAL SKY SHARE for a limited time. Via the innovative JAL SKY SHARE, you can send personalized postcards and video messages to friends and families using photos taken during your flight. A youtube video summary will also be sent to you upon arrival. Japan Airlines has once again collaborated with Soup Stock Tokyo, a popular soup restaurant chain in Japan, to create a new breakfast menu for select international flights departing from Tokyo Haneda. This menu will replace the existing NORIBEN (seaweed bento) menu. The first installment will be a Tomato Stew with Chicken and Vegetables served between September 1 and November 30 2013. JAL will finally expand its SKY Wi-Fi service to the Tokyo Narita - Jakarta route from December 29 2012. Originally JAL planned to roll out SKY Wi-Fi service to the Jakarta route from the end of October but has been delayed till now. Say Hello to JAL brand new 777 cabins, New York! JAL is rolling out brand new cabins on its long-haul 777-300ER fleet to the Tokyo Narita - New York JFK route in early May 2013. Currently JAL is providing daily SS7 service on the Tokyo Narita - London Heathrow route. JAL opened a new JAL First Class Lounge and Sakura Lounge at Tokyo Narita on September 29 2012. There are plans to refurbish other JAL lounges too. JAL will launch JAL SKY SUITE 767 on December 9 2013. Image by Japan Airlines. Japan Airlines (JAL) has finally announced the launch date of the new long-haul Boeing 767-300ER cabin dubbed JAL SKY SUITE 767 (SS6). 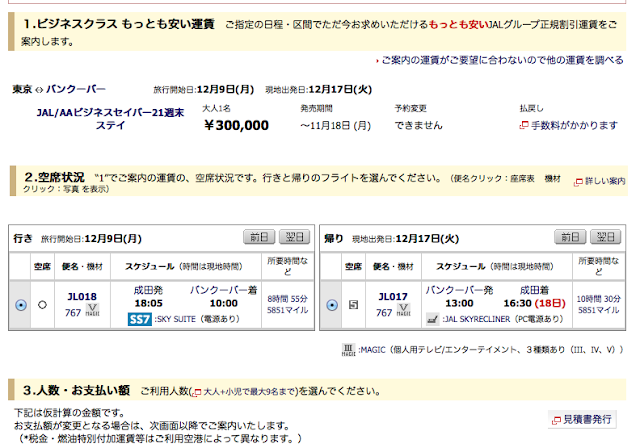 As reported before, JAL will launch SS6 on December 9 2013. Initially it will be deployed on the Tokyo Narita - Vancouver route and will be progressively expanded to the Tokyo Narita - Kuala Lumpur route in January and other long-distance routes in Southeast Asia and Honolulu routes in fiscal year 2014. JAL website mistakenly identifies SS6 flights with SS7 logo. Image from JAL website. Note that JAL does not say SS6 will be provided on the Vancouver route daily in the announcement. You will have to check the timetable or the booking engine to find out if your flight will be operated with the new SS6 cabin. Right now there's a problem on JAL website showing a "SS7" logo instead of "SS6" one on the SS6 flights. Even though JAL claims that advanced seat selection on SS6 starts today, we all know that's not true. The seat maps have been loaded for almost 2 weeks now. That's how I found out about the rollout schedule in advance! According to the booking engine, initially only 6 weekly flights will be operated by SS6. The Vancouver flights will be operated with the older A43 configuration with JAL SKYRECLINER every Tuesday. This is probably due to a weekly maintenance schedule. The SS6 service will turn daily from January 29 2014. But as usual, due to operational reasons, the cabin and rollout date could change with or without notice. As for the Kuala Lumpur route, the seat map still only shows SS6 on flights from February 1 2014 only. And initially it will be a 5 weekly service with A43 configuration deployed on every Wednesday and Thursday. JAL First Class award inventory is wide open!? How did JAL design the new SKY SUITE and SKY WIDER seats? If you have contents that you think is suitable for this site, want to be a guest or even a regular blogger, feel free to drop me a line via e-mail. My email address is pak @ jalflyer dot com. For more details, please refer to this page. Copyright 2009 - 2019 | JAL Flyer. Powered by Blogger. Disclaimer: JAL Flyer is an independent website and has not been authorized, sponsored, or otherwise approved by Japan Airlines Co., Ltd.